I am writing this blog on July 4, 2012. We all know on this day in history, in the year 1776, the Continental Congress adopted the Declaration of Independence. However, I was surprised to learn that on July 4, 1826, two of our Founding Fathers, Thomas Jefferson (82) and John Adams (90) died. Additionally, Calvin Coolidge, the 30th President of the United States, was born in Vermont on July 4, 1872. On July 4, 1960, the 50 star flag made its debut in Philadelphia. Today, I find myself channeling the energy of this historic day to write a blog that celebrates an author who has spent her career writing and illustrating books to help children better understand history, encourage them to use their imagination, and to inspire a pursuit of additional knowledge to enhance their citizenship. Cheryl Harness has written and illustrated over thirty books for children including books about some of our Founding Fathers, The Remarkable Benjamin Franklin, Thomas Jefferson, and The Revolutionary John Adams. Her career began after she attended a children's book workshop taught by Uri Shulevitz in 1984 that encouraged her to present her illustrations to editors in New York City. In 1992, she wrote her first historical book, Three Young Pilgrims. She said in an interview with Embracing the Child, "I got a bang out of doing it and since I'm not a total goober, I've done historical books ever since." In her book, Grab Hold of the Past (only 99 cents for Kindle), Cheryl Harness mentioned her creative process, "Reading, traveling, gathering information, distilling, clarifying, outlining, writing. (Illustration comes later.) Revising, rewriting, and fussing until the text is clear, accurate, concise, and as engaging as it can be. Surrounded with propped-up, clamped-open research books, I scribble, draw, erase, photocopy, cut, tape, redraw, and finally paint pictures of long-gone people in a vanished world as vividly as I can." (pages 65-66). The historical book by Cheryl Harness that caught our attention this week was The Amazing Impossible Erie Canal. My children I learned that the quest to build the Erie Canal began on July 4, 1817, in Rome, New York, and the completion of "America's First Superhighway" was a "huge accomplishment for a young nation". This book is written and illustrated in a way that really helps the reader imagine what it would have been like to have been there for the early days of the Erie Canal -- to hear the sounds of "cowbells, bullfrogs, and steady hoofbeats on the towpath" and to see "the fitted stones in the wet walls as the gates were opened and closed, allowing water to flow out to the next lock, lowering boats one by one, level by level." This book is jammed packed with beautiful illustrations, facts, diagrams, and maps to study and pour over again and again. 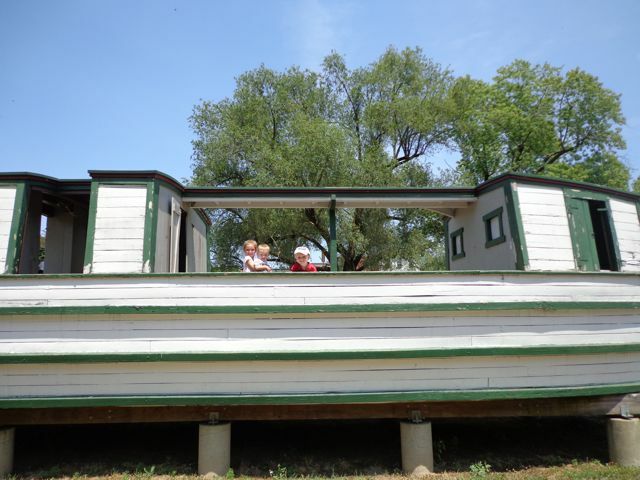 I thought about the Ohio and Erie Canal, within driving distance of our house, as I read The Amazing Impossible Erie Canal to my children. I wondered if there were similarities between the Erie Canal in New York and our canal here in Ohio. 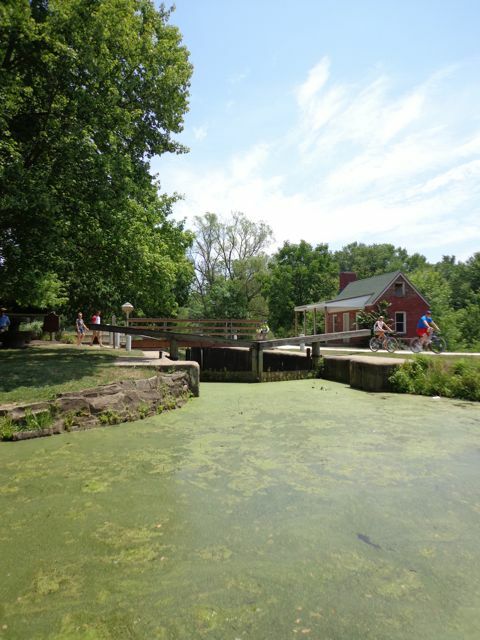 After a little research, I learned that the Ohio Canal Commission hired James Geddes, the engineer of the Erie Canal, to determine the best routes for canals in Ohio. 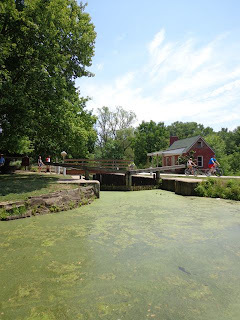 I also learned that the Ohio and Erie Canal actually broke ground 8 years after the Erie Canal on July 4, 1825 at Licking Summit, just south of Newark, Ohio. The New York governor and champion of the Erie Canal, DeWitt Clinton, helped dig the first shovels of dirt along with Ohio's governor Jeremiah Morrow. (Ohio History Central). 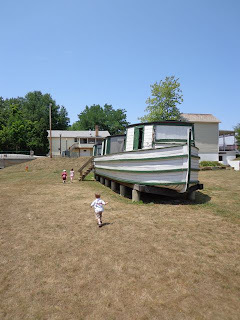 This research eventually led me to the Ohio and Erie Canalway's website and a perfect activity to allow my children to experience how life may have been on the canal. 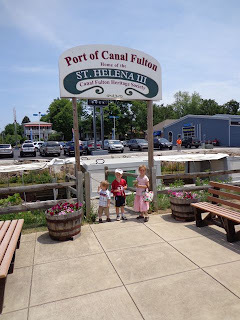 We headed to the city of Canal Fulton, Ohio to ride the St. Helena III, a replica of a freighter which voyaged along the Ohio and Erie Canal over 100 years ago. 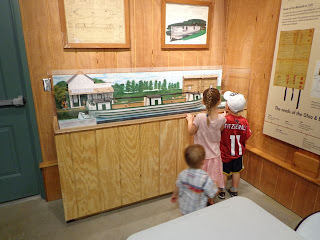 The visitor's center, where we purchased our tickets to ride, allowed us to view a model of the canal boat and to watch a 30 minute video that provided information about the history of the city and of the Ohio and Erie Canal. My daughter made a connection to The Amazing Impossible Erie Canal during the video when James Geddes was mentioned. Her statement, "Hey, its James Geddes!" made it sound like they were pals. Once the video concluded, we headed to the dock, with tickets in hand, to anxiously wait to board the boat. 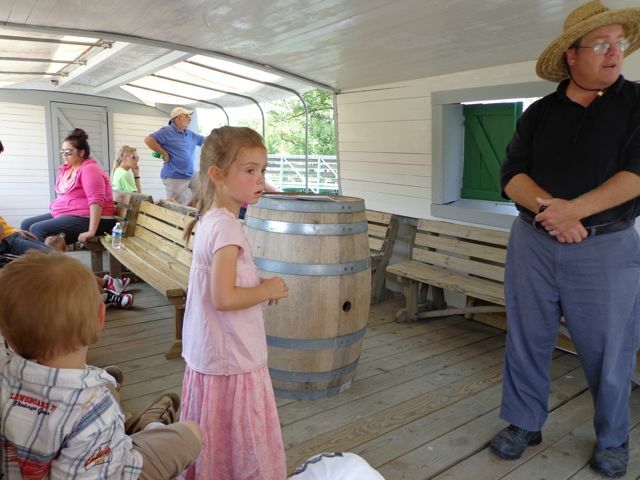 Later, we learned that there were three main sections to this canal freighter -- living quarters, a stable for mules or horses, and storage areas for cargo. Our canal boat ride was about 50 minutes. Along the way, our guide enlightened us with canal history and stories. We learned that the canal was only profitable for about 25 years, but its importance to the economic development of Ohio is undeniable. We were able to see Lock IV which is one of the few remaining locks along the Ohio and Erie Canal. Many locks were lost during the Great Flood of 1913. 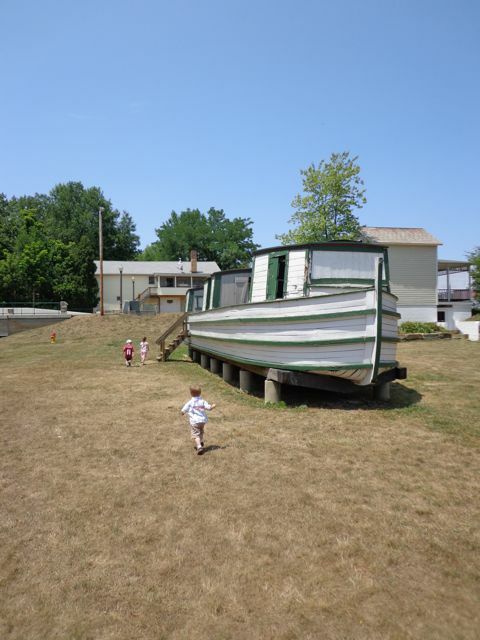 After our canal boat ride was complete, the kids ran over (I walked) to the retired, St. Helena II. 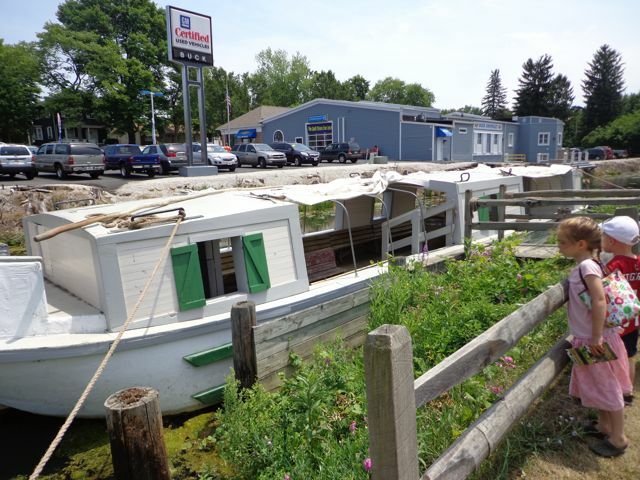 This replica was retired in 1988 and now sits next to a small museum dedicated to the canalway. Low bridge cause we're coming to a town." 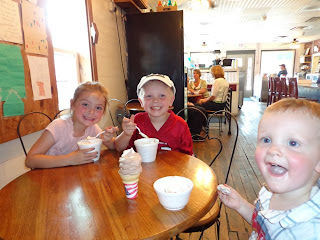 It was a fun and warm day that needed just one more thing - ice cream! We stopped at a shop right across the street that served enormous cones and sundaes. We wondered "What is Cheryl Harness' favorite flavor of ice cream?" 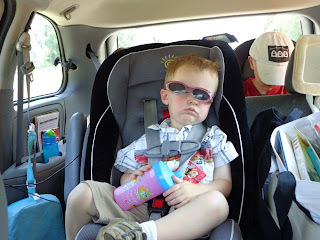 My little guy, who just turned 2, was such a trooper on this experience. But, he conked out as soon as I left the parking lot. As for my birthday memory, I'd say July 6, 1957, when I turned six, here in Independence, MO. My mom fixed my favorite supper, i.e. spaghetti. Baked a cake. And I received a Tiny Tears doll with dark, curly rooted hair. Come to find out later on that former President Herbert Hoover was in town that day along with former First Lady Eleanor Roosevelt for the dedication of the Harry S. Truman Presidential Library and Museum. Harry and Bess were there, too, of course (Did you know that their 93rd wedding anniversary was on June 28, 2012?) Come to find out still later that it was on that same day that teenagers Paul McCartney and John Lennon first made one another's acquaintance, at a church fair. Cheryl, thank you so much for sharing your birthday thoughts. We hope you have an enjoyable birthday! 4. Cheryl Harness Blogs at I.N.K.